Senator Kyle McCarter of Illinois and his wife Victoria have a remarkable story of generosity. They have been involved with Mercy Multiplied since the early 2000’s due to a tragedy within their family. Their daughter, Amber, was in the application process to attend Mercy when she passed away unexpectedly in 2006. This led the McCarters to give to Mercy in memory of their daughter. Our Mercy home in St. Louis currently has a room dedicated to Amber. There is also a water color painting created by Amber when she was 15 that hangs in the home. Each year, they give every St. Louis resident a framed copy of the painting as a Christmas present. The McCarters not only give to Mercy through their resources, but they also give of their time and energy. Victoria McCarter has run multiple half-marathons while praying and fundraising on behalf of Mercy for each race. Kyle McCarter served as the President of our Community Board at Mercy. He and his wife sponsor a Valentine’s dinner every year for the St. Louis residents and they even take the residents on an annual tour of the Illinois State Capitol. 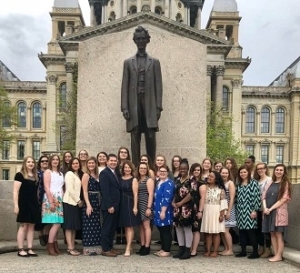 This year on the National Day of Prayer, Senator McCarter and Victoria took the residents on a grand tour through the Old Capitol at the Governor’s Mansion and to see the Abraham Lincoln Statue. They spent time praying for our nation, their families, schools and churches. They attended a special catered lunch in a reserved room in the Lincoln Towers. Senator McCarter took the girls on a tour of his office where he shared with them about his responsibilities and how God gave him a passion to be a voice in the legal system. 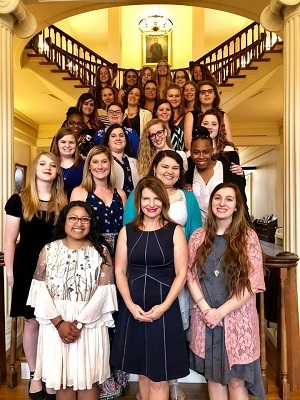 The girls were then given the opportunity to watch the Senate in session where they were honored as the session’s special guests. To end the day of adventure he took the residents on a tour of the home where Abraham Lincoln was raised. The residents shared that they had a great time learning about the history of our Nation and our leaders. They enjoyed being a part of the session and learning more about how our legal system operates. Senator McCarter was recently appointed by President Donald J. Trump as Ambassador Extraordinary and Plenipotentiary of the United States of America to the Republic of Kenya. We are thankful for Senator Kyle and Victoria’s support and voice in our ministry. They have given above and beyond to Mercy Multiplied. You can join the McCarters in the “Me in Mercy” movement, as there are many ways to become a Mercy partner. Plus, visit our Tour A Home page to schedule a free tour of one of Mercy’s four U.S. homes located in Nashville, TN; St. Louis, MO; Monroe, LA; and Sacramento, CA.